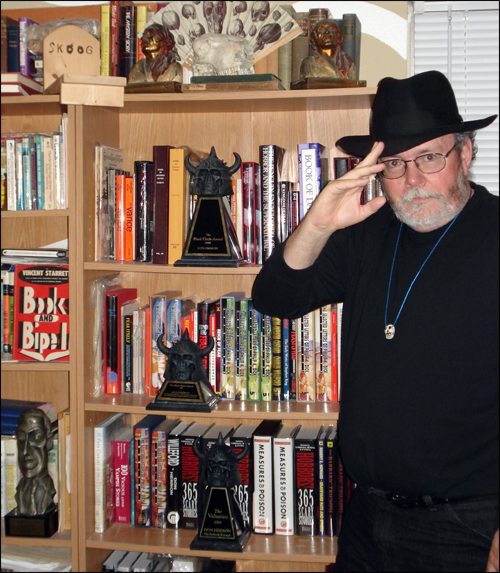 In the photo above you can see Don posed with the three Cimmerian Awards he has landed thus far — this shot being an alternate that wasn’t used in the new Cimmerian Awards issue coverage. For that issue Don contributed numerous blurbs as well as a short essay comparing the Cimmerian Awards with various trophies which belonged to the late, great fantasy and science fiction grandmaster Fritz Leiber — in fact, he sent in more blurb matter than could be squeezed in. If you want the story-behind-the-story of the existential ordeal he experienced trying to figure out what kind of photo to take, click here to read a mini-essay that ended up on the magazine’s cutting room floor. Also available now is the April 2008 issue of The Cimmerian, which in addition to other features offers a taste of the new French book on Robert E. Howard in English translation. 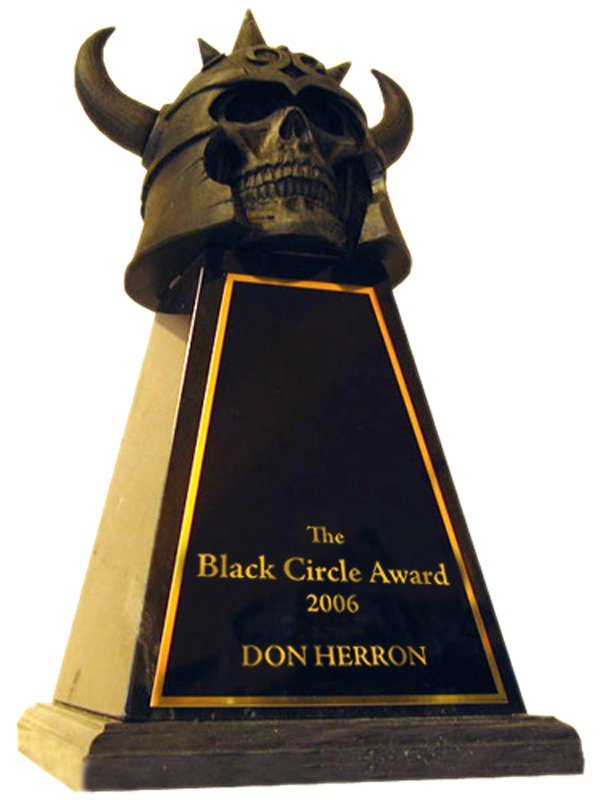 You can order Échos de Cimmérie to read Don’s essay “The Feast Is Over” in French, or you can read the American version in the April issue of TC along with two other pieces Fabrice Tortey has lined up for his tribute to the creator of Conan. Don had a great time at NoirCon last month, of course, hanging out with Dennis McMillan and Ken Bruen and company — one little highlight was when George Pelecanos spotted a copy of the Richard Stark paperback original novel The Outfit for Don to buy when they were browsing in a warehouse-sized Philadelphia bookstore. Plus local noir guy Eddie Muller made the scene, too — and Eddie tells us that he has a long feature piece on current San Francisco and Bay Area noir and hard-boiled writers in the book review section of the San Francisco Chronicle on Sunday May 4th. If you want to check out the latest on our local action, don’t miss that one. Last month saw the centennial birthday of Donald A. Wandrei, and our pal Morgan Holmes over on the REHupa website did a nice blog post pointing out several reasons why Wandrei stands as one of the more important figures in the history of fantasy and science fiction. Surf over to that post if you’re curious — and expect more Wandrei material here as his centenary year marches on. And finally, just like it says on the Tour Page, you’ll find a Hammett walk going every Sunday this month at noon. Grab ten bucks, pick a Sunday, show up and walk the walk — that’s all there is to it. 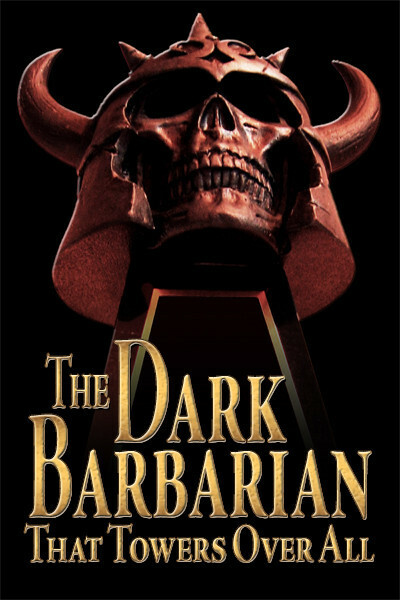 This entry was posted in DMac, Lit and tagged Cimmerian Awards, Donald Wandrei, Donald Westlake, Eddie Muller, Fabrice Tortey, Fritz Leiber, George Pelecanos, Ken Bruen, Noir Con, The Cimmerian. Bookmark the permalink.